Many couples aren't sure if they need me to photograph them as they get ready for their wedding. 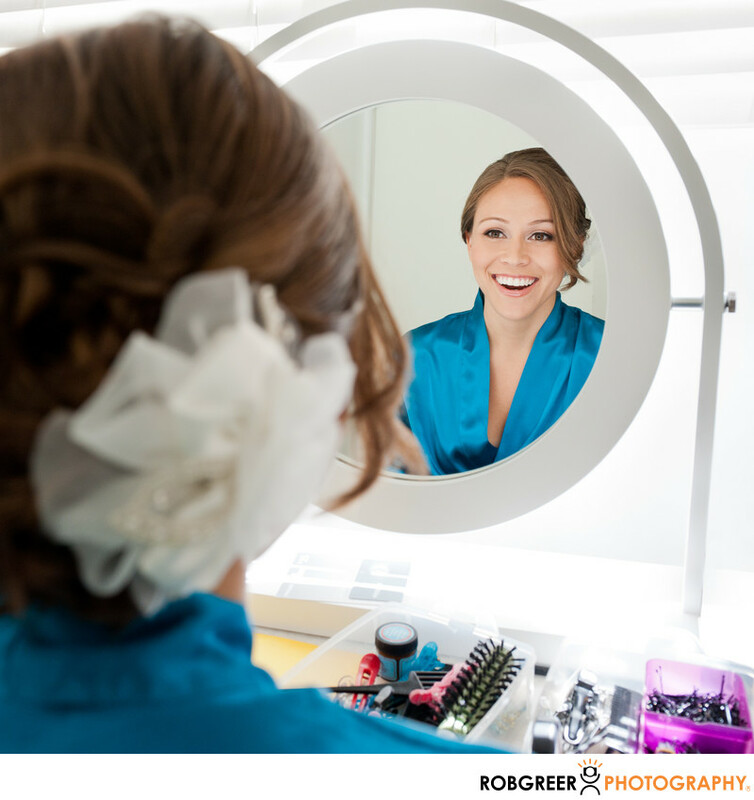 As the bride got ready at the Avalon Hotel in Beverly Hills, I was able to capture this moment as she looked at her makeup in front of her own mirror for the very first time. I think that you can recognize the joy on her face. Some of the things that I enjoy about this photograph, besides the bride's expression, include the wonderful colors ranging from the turquoise of the bride's robe, to the purple of the hair clip box on the table in front of her. I also enjoy the various hairstyling products that are arrayed before her. I see that sort of thing and want to look forward and the time and think of how people in the future might view those items. You'll often see old photographs featuring a woman's dressing table and that table looks very different today. I can only imagine that it will again look quite different in 40 or 50 years. When I create photographs, I often try to think of them in their historical context and by doing so I believe that I help them retain their importance over time. Avalon Hotel is located in Beverly Hills, California. Phone: (310) 277-5221. Website: http://www.viceroyhotelgroup.com/avalon. Contact Person: Jeremy Keller, jeremy.keller@viceroyhotelgroup.com. Location: 9400 W Olympic Blvd, Beverly Hills, CA 90210. Keywords: Avalon Hotel (3), Beverly Hills (3). 1/60; f/5.0; ISO 640; 31.0 mm.